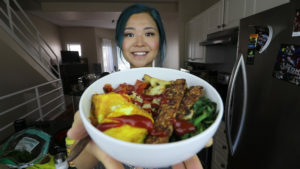 Watch video above to see how I made this delicious rice bowl! If you guys know me but at all, you would know that I could eat rice any time of day. I’m Korean so eating rice for breakfast isn’t anything out of the ordinary for me. 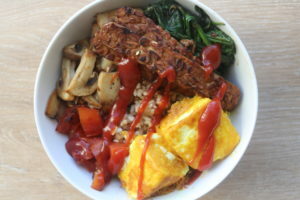 I had this idea to create a breakfast style rice bowl, as I’ve seen a few of these around in the non-vegan world. 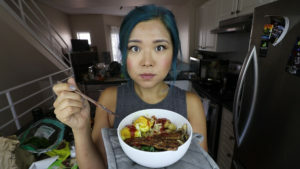 I decided to film myself trying to cook this for the first time – as part of my “Cook With Me” video series. 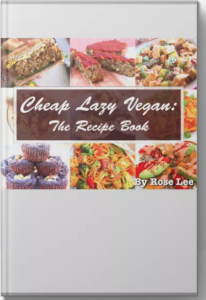 The biggest “challenge” for me was trying to make a TOFU EGG. I decided to use soft tofu which I would coat in a mixture of spices and potato starch – I wanted to replicate that soft egg-white consistency… smooth, custardy type of texture. Cut the tofu into six square pieces. Mix all other ingredients together in a plate. 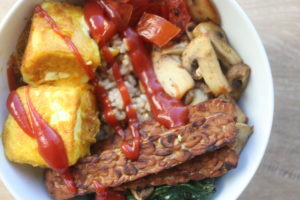 Coat each piece of tofu on each side with the mixture of spices. Add a generous amount of oil onto a non-stick pan on medium-high heat and cook the tofu on each side until nicely golden. Add a little water with potato starch to create a liquid. Mix dry spices separately onto a plate. Coat the tofu in the starch water first, then toss in the dry spice mixture – then proceed to cook on the pan. Dip the tofu into a non-dairy milk first, then dip it into the starch & spices mixture – then proceed to cook on the pan. Try cooking the tofu in an air-fryer! 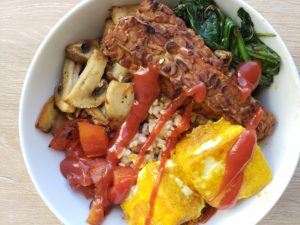 There are many different options to try and make this tofu – you could also deep fry if that’s something you’re comfortable with! I just never deep fry anything so to me, that wasn’t something I was interested in. 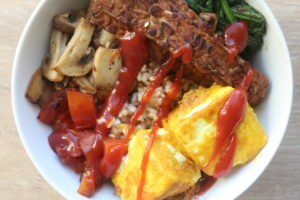 For the bowl, I decided to add a mixture of different things – I LOVE having a variety of foods in one meal. I know that rice for breakfast isn’t something you might be used to, but I urge you to give this a go! Or if you really can’t stomach it in the morning, you could always have this for lunch or dinner – who says you can’t have breakfast style food all day, anyway? 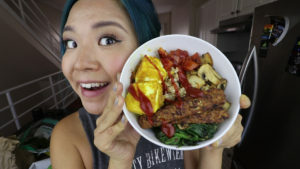 Check out my video above to cook with me and watch me assemble this delicious bowl! 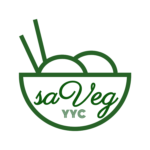 ← Vegan Soybean Paste Stew MUKBANG/EATING SHOW! 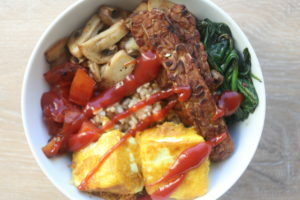 Wow, I NEED to try your vegan egg tofu seasoning to use for my tofu! It’s funny given that I JUST bought nutritional yeast. Hey, this might be the best coincidence I’ve run into!